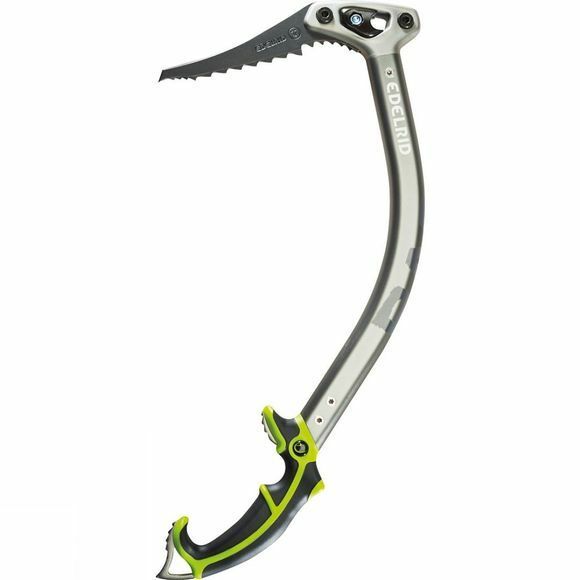 The Rage Ice Axe from Edelrid is an extreme tool for demanding mixed routes and steep ice. The aggressively cut shaft provides additional clearance, while the balanced construction ensures accurate placement and penetration on rock and ice. With an ergonomic triple-component handle for multiple grip positions the Rage can be easily swapped between hands. A hardened steel waterfall pick has been added for great purchase and easy removal on steep ice. Balance is ensured with a removable accelerator helping drive the pick into the axe, and the modular construction can be adapted to suit all uses and conditions.